GENG Jianyi (b. 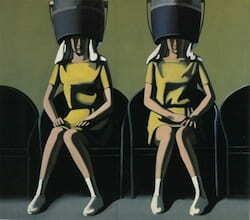 1962), Salon de Beauté, China, 1985, oil on canvas, USC Pacific Asia Museum Collection, Gift of Waldermar A. Nielsen. Asia to the residents of southern California. The exhibition will revisit two prior exhibitions, Beyond the Open Door: Contemporary Paintings from the People’s Republic of China in 1987 and I Don’t Want to Play Cards with Cezanne and Other Works: Selections from the Chinese “New Wave” and “Avant-garde” Art of the Eighties in 1991. The exhibition, together with The Rent Collection Courtyard, will examine Chinese art during a period when art was created to meet political demands and explore how the art of this period fits into the continuum of Chinese art history. Following a Starbucks coffee break in the tranquil courtyard, the curatorial staff lead a focused tour and discussion of the exhibition.